Full Circle Response Management provides the marketing attribution and funnel analytics reports and dashboards to optimize the company’s marketing mix, align sales and marketing, and drive more revenue. 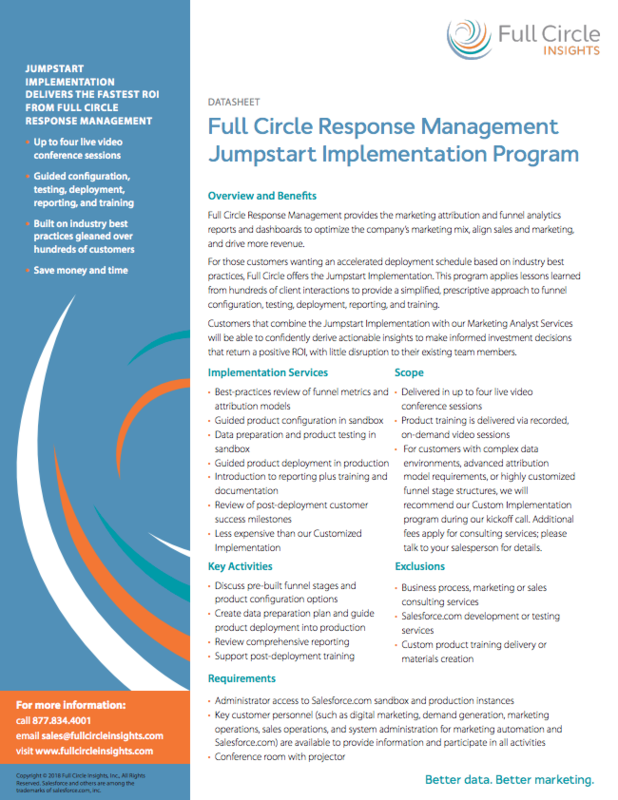 For those customers wanting an accelerated deployment schedule based on industry best practices, Full Circle offers the Jumpstart Implementation. This program applies lessons learned from hundreds of client interactions to provide a simplified, prescriptive approach to funnel configuration, testing, deployment, reporting, and training. Customers that combine the Jumpstart Implementation with our Marketing Analyst Services will be able to confidently derive actionable insights to make informed investment decisions that return a positive ROI, with little disruption to their existing team members. Download the Jumpstart Datasheet below for more information on this service.